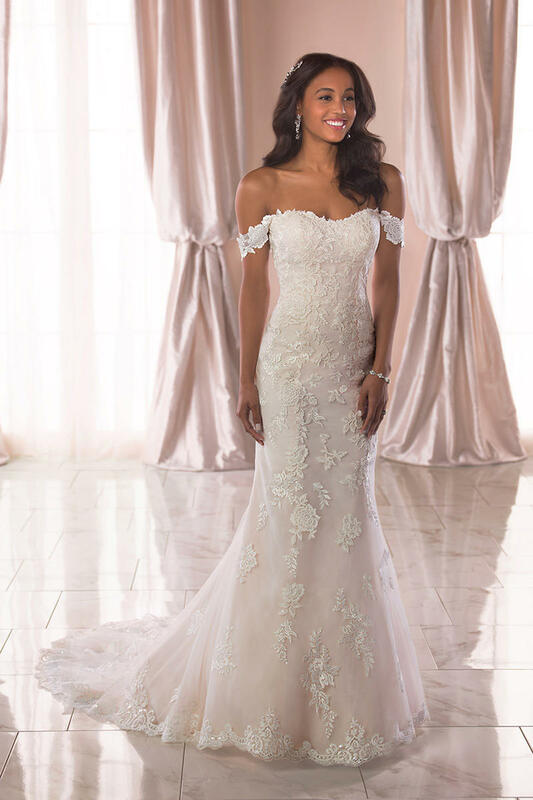 Utterly romantic, this lace wedding dress with off-the-shoulder straps is simply breathtaking! Bridal designer Stella York does it again with this enchanting style stunner. Lace, tulle and Regency Organza create a relaxed fit-and-flare silhouette with lace straps that can either be worn draped over the shoulders, or up as straps. There is a sheer corset-style back detail on this dress that gives it a very romantic versatility. A modern, slightly sweetheart neckline is adorned with organic finished lace and 3D florals. Overall, this dress feels formal and romantic, yet the fabric and silhouette keep it fresh and light. This lovely gown is available in plus sizes.